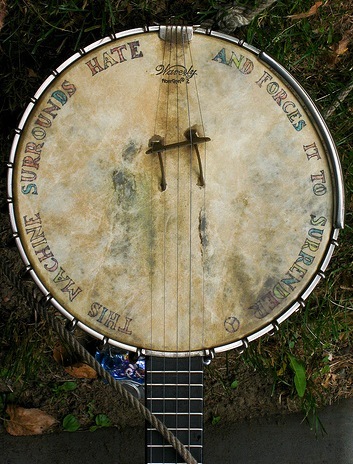 Pete Seeger's banjo, taken at the 2009 Clearwater festival. By Paul VanDerWerf, via Flickr. Even though it’s not yet the solstice, summer officially starts in my book with Clearwater’s Great Hudson River Revival festival. Each Father’s Day weekend, the migratory instinct takes over and steers me to Croton Point Park, a bit north of New York City on the Hudson Line of the Metro-North railroad. You can find me perched along the river with scores of other music lovers, activists and artists, giddy with anticipation for a weekend of inspiring music, storytelling, activism and dance, all on seven stages powered by sustainable energy — solar, bio-diesel and wind — along with the power of a thousand volunteers. This festival is part of a fine tradition of advocacy, education and celebration in service of cleaning up and protecting a mighty river. At its widest, the Hudson stretches more than a mile wide and, at its deepest, it is hundreds of feet to the bottom. Its water flows both ways according to the tides for about half of its 300-mile length, from New York City to tiny Lake Tear of the Clouds in the Adirondacks. It has inspired countless artists, writers and musicians, and has played a critical role in transportation, livelihood, recreation and resource supply for the northeast for millennia. Some 45 years ago, radical musician and Hudson Valley resident Pete Seeger realized that the way to clean up this by-then neglected and very dirty stream was to get people to care about it — to lure them down to its banks so they would appreciate its beauty and be moved to clean it up. That was organizing lesson #1 from Pete and Clearwater: Start with music and food, and people will come. Today, the Revival is recognized as the country’s oldest music and environmental festival. The organization and its namesake, the 106-foot Hudson River sloop Clearwater, have become a force of nature in their own right, educating thousands each year, litigating for the health of the river and its entire ecosystem and inhabitants, and investing in and activating the next generation of environmental leaders. Clearwater has set the standard for hands-on environmental education and advocacy worldwide. I was fortunate enough to have crewed on the boat for many years, earning a captain’s license and falling in love with the river and the community that supports it. There, I learned an invaluable organizing lesson: Meet people where they’re at, and provide ways to be involved that cater to their comfort levels. Just the music and maintenance needs of the boat alone provided plenty of opportunities to contribute and become forever a part of the tribe. Summer music and art festivals are fabulous places to feel like you’re on vacation and to immerse yourself in an alternative reality. At Clearwater, there is much more than most music festivals have to offer — you can volunteer and camp out for the whole weekend, or just visit for a day. You can help the Revival reach its zero-waste goal by using the compost, recycling and trash containers. Facilities are accessible for all, whether you need assistance with your wheelchair or need to follow the sign-language interpreters stationed at every stage. Visit the animals in the Touch Tank or zoom in on zooplankton under a microscope; sing out at the Circle of Song or strum with the best at the Jam Tent; experience a working waterfront by paddling, sailing, rowing or helping to carve an oar. As Clearwater reminds us, integration of arts and culture into our movements and campaigns serves many functions. It is so clear that the Revival not only teaches us new songs but also breathes new energy into our work, reminding us of our potential to take care of each other and our planet, and to establish different ways of being — even if only for a weekend. New tools and leaders can be incubated, new strategies debated, and new connections made with potential allies. On a very basic level, folks who came to the festival for a headliner act can leave with information about environmental actions necessary for the health of the river. Arts and music can help seasoned activists overcome political barriers and reach new constituencies. Although I often leave Croton completely exhausted, physically — from trying to be at every stage at the same time, from talking about Zero Waste to 10,000 people, from hugging old friends — I always head home humming a new tune, feeling that perhaps there may be a way for us to work together to ensure a brighter future for people and the planet. If you can, make your way to the Clearwater Revival. It’s all good, and for a good cause. I’ll be there working Communications and Zero Waste, and WNV editor Nathan Schneider will be there too, volunteering in the Activist Area. Join us! I went this year for the first time in many years, and had a blast. I had the chance to play on a stage hosting an hour of songs against hydrofracking – Bev Grant, Colleen Kattau, Sarah Underhill, y. truly – a great way to fit politically/socially directed music into a festival of bigger names. Many festivals would never do this. Also the presence of activist groups with their info, like Military Families Speak Out, Veterans for Peace, environmental groups – great opportunity for folks to integrate social responsibility with their family music outing. (And Pete came, all 93 years of him). Dave– you are right on, most music festivals not only won’t include activists, but also discourage dialogue around real issues and select musicians that won’t rock the boat… in this case,the entire community is aware that rocking the boat might just be what gets the goods! Sorry to miss you and the anti-Fracking set, I am sure it was musical and motivating!